The direct route from Marseille to Nice takes just over two hours, but this road trip through the south of France by motorhome will have you stopping off at dozens of incredible towns, cities, and attractions along the way, each offering up sights so spectacular you’ll want to stay for weeks. Summer is the obvious time to visit, as you can’t go wrong with the endless sunshine and hot days it promises. That said, it is the balmy south of France, and visiting in spring or autumn will often bring just as much sunshine and warmth without the crowds. Or, for those who love snowy mountains, this itinerary in winter promises a few days on the slopes as well. Pick up your motorhome in Marseille and follow this route to a T, or start your trip in Nice and head in the other direction. However and whenever you take a drive through this magical area, it will be nothing less than unforgettable. Start your southern France motorhome tour with some of the best sights in the country when you begin in Marseille and take an extremely winding route to Avignon. You’ll stop at a handful of the small towns of Provence before making your way into the old Roman towns of the countryside such as Arles and Nimes. You’ll want a week at least to complete this leg, as even though it’s only a few hours of driving in total, there is more than enough to see and do in every place you visit. The words ‘rushing’ and the ‘South of France’ don’t even belong in the same sentence together, so be prepared to take this leg nice and slow. Marseille is a historic port city that’s been a hub for trade and immigration for centuries. It’s the second largest city in the country (after Paris), and a beautiful place to begin any motorhome road trip in France. Before you head off on your South of France adventure, there are a few top spots you’ll need to see in Marseille before hitting the road. Start with a relaxing stroll around the Old Port (the Vieux Port), which is filled with bustling restaurants, bars, and cafes, and is where you can enjoy the hubbub of a port which has been a central component in European trade essentially since ship trade began. Another stop is the Notre-Dame de la Garde, a towering basilica built on the highest point in the city, and well worth the tough walk up the steps to the top. It was built in the mid-1800s and is filled with gorgeous mosaics and coloured marble designs, plus it offers an incredible view of the port itself. Fans of Alexandre Dumas will also enjoy a day trip to the island of If for a visit to the Chateau d’If, a historic prison fortress that was the setting for Dumas’ famed Count of Monte Cristo. When you’re ready to get moving, head north out of the city via the A7 to make your way to Aix-en-Provence. Aix-en-Provence is a small and adorable historic town that was once the capital of Provence. Today, it’s a welcoming spot that will help you get a feel for the south of France and its culture. While you’re in town, pay a visit to Cezanne’s studio, where this famous painter created many of his world-renowned works and where you can pick up a souvenir or two at the gift shop. Afterward, see some of the paintings in question at the Musee Granet, a building dedicated to archeology, painting, and sculpture. It’s here where you’ll find a few works by Cezanne, as well as others by Rembrandt and Ingres. 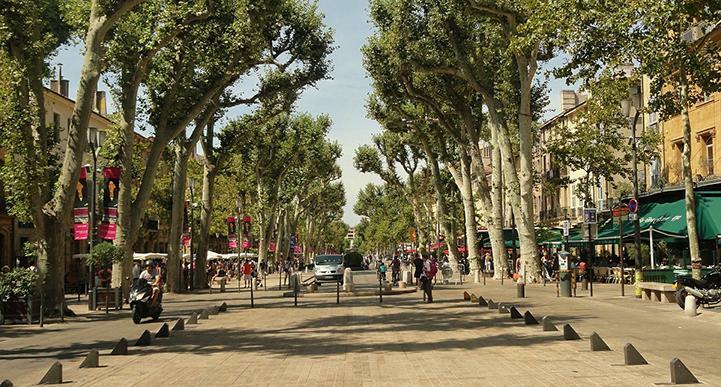 You’ll also need a lazy afternoon to stroll through the Cours Mirabeau, a wide and leafy avenue packed with shops, cafes and restaurants and generally considered to be the heart of the city. Finally, stop by the stunning Aix Cathedral, a religious site that was built in several styles (from Gothic and Baroque to Roman and Romanesque) thanks to various interruptions in construction. From here, strike out eastwards on the A8 for a short drive to your next destination. Salon-de-Provence is smaller again from Aix-en-Provence, but still has plenty to see and do as you pass through. La Maison de Nostradamus is where famed philosopher Nostradamus (real name Michel de Notredame) lived for more than 20 years before his death, and is now a museum dedicated to the man’s work and philosophies. Just down the road you’ll find the Chateau de d’Emperi, a castle built in the 9th century and a French historic monument. It has been home to Roman emperors and archbishops, it has spent time as a jail, and now houses a museum of art and history of the military. And of course, you must visit the Fontaine Mousse (mossy fountain) before you go. Exactly as the name suggests, this iconic structure in Crousillat Square is a massive fountain of moss, worthy of a stop for a few snaps or simply a stroll. From here, head back to the A7 heading north to drive to your next stop. St Remy de Provence is the very essence of French charm. It’s another small town with just 10,000 inhabitants, all of which enjoy the relaxed and welcoming vibe of this Provence ‘must see’. Vincent van Gogh spent time here, producing more than 150 paintings in the countryside around the town, and you can take a look into his life at Musee Estrine, a location dedicated to his works. Take a much larger step back in time by exploring Glanum, an ancient Roman city that was abandoned in 460 AD. Over the years archaeologists have excavated its grounds and unlocked secrets about the ancient Romans and how they lived, and you can learn more with a self-guided tour when you arrive. Next, make your way east then turn south to find your way to Arles. Arles offers a welcoming introduction into the Camargue region of southern France. With a vast amount of Roman history, dozens of places that inspired works by Vincent van Gogh, and a thriving modern city on top of it all, you have the ideal place to spend a few days during your motorhome tour. First, take a look at the events calendar to see if anything’s happening in the Arles Amphitheatre. This two-tiered Roman arena is a historic spot that’s still used for outdoor performances and shows, and it’s still well worth a look even if you can’t find any events. For more Roman history, pay a visit to the Montmajour Abbey, where you’ll find a 12th-century church built in gorgeous Romanesque style. It has been listed as a UNESCO World Heritage site and is found on a small island just north of Arles city. For art fans, stop by the Vincent Van Gogh Foundation, a modern building that houses some of his works alongside other paintings by contemporary artists. Before you leave Arles behind, make a final stop at Camargue, just south of the city. This natural wetland is brimming with wildlife, from bright flamingos to white horses and all kinds of migratory birds. You can take a guided tour to see the salt flats, nature reserve, and marshlands, or simply get behind the wheel of your campervan and explore this natural expanse yourself. From here, head due east toward Montpellier. Spend a day exploring the Castle of Flaugergues, a grand French chateau that’s famed for its beauty, landscaping, and delicious wine. A peek inside the castle will give you a look at antique furniture and Flemish tapestries, and a tour of the gardens promises nothing short of awe as you take in centuries of landscaping from nobles and wealthy merchants. When you’re ready for a few refreshments, stop by the restaurant for a luxurious and decadent meal outside on the terrace. Note that it’s best to reserve a table ahead of time so you don’t miss out. Finally, the castle’s vineyards have been producing grapes since Roman times, so stop by and pick up a bottle or two to enjoy when you settle down for the night in your RV. Now turn that motorhome back around and make your way up the A9 and into Nimes. Nimes carries the nickname of ‘French Rome’ thanks to its extensive history and collection of grand Roman structures that still remain today. Amongst the most notable of these is the Pont du Gard, a massive aqueduct built across the Gardon River that’s been placed on the UNESCO World Heritage list. The site is one of France’s most popular attractions, and it is once believed to have helped carry more than 27,000 litres of water from a spring in Uzes into Nimes every single day. Another of the sites includes the Arena of Nimes, an amphitheatre built sometime around AD70 and remodelled in recent times for use as a stadium for sports and performances. It’s an example of Roman perfection, as this massive arena is perfectly oval in size, and it remains today as one of the best preserved examples of its kind. 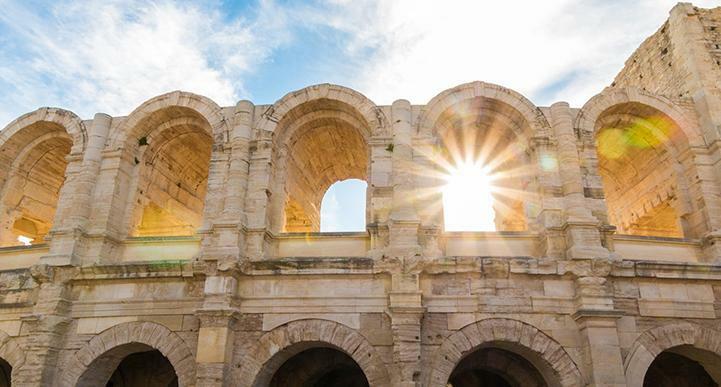 You can’t miss the remnant of Roman culture throughout Nimes, with dozens of examples of ancient architecture around the city, but there are plenty of modern amenities and shops as well, so allow at least a few days to explore this historic destination. 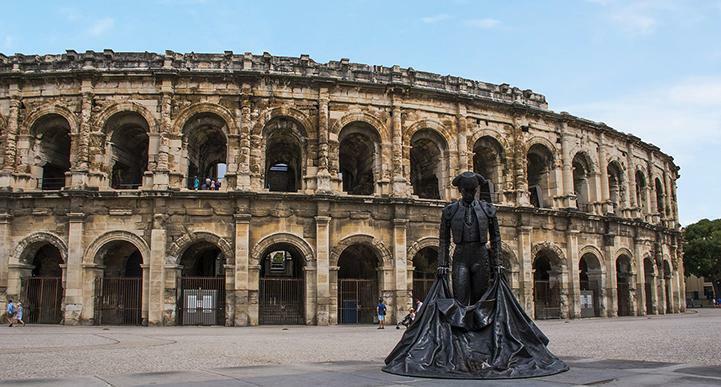 It’s just 45 minutes from Nimes to begin the next leg of your motorhome itinerary. The next stretch of your campervan road trip around the south of France will take you from beautiful Avignon to stunning Lyon. Naturally, taking the fastest route won’t let you see some of the best sights along the way, so this version covers roughly 350 kilometres and makes a few detours to make the most of the trip. The drive is saturated with Roman history, but you’ll still get plenty of opportunities to indulge in the French culture of the region. You’ll want to set aside a good few days to cover this leg, as well as plenty of space on your camera to ensure you capture everything along the way. History lovers rejoice! It doesn’t get much better than Avignon and its rich stories from the past. Many of the city’s major attractions are exemplary sites from ancient times, so you’ll certainly need a few days at minimum to see even just the main ones. Begin your tour at the Palais des Papes, a fortress and palace that was once the seat of Christianity in the 14th century. This massive structure is easily one of the most significant religious sites Europe, and its phenomenal architecture and grand spaces make it worth a visit for people of all religions. This UNESCO World Heritage site is one of the most popular destinations in France, so book any tours ahead of time so you don’t miss out. 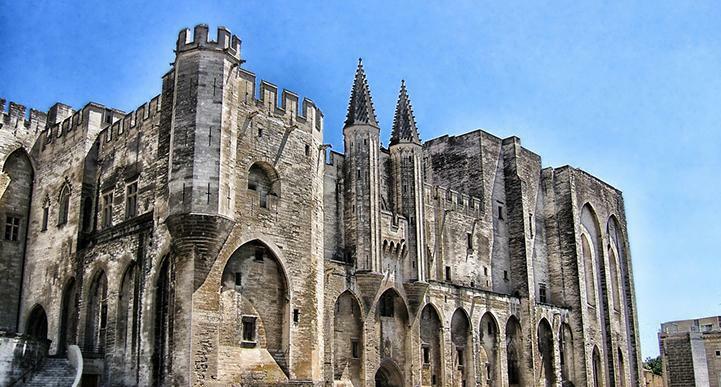 Just next door, the Avignon Cathedral offers another awe-inspiring structure that was built in the late 12th century. While it’s not quite on the scale of the Palais des Papes, this cathedral is still magnificent, and complete with Gothic tombs and a powerful history that you can learn more about on a guided tour. Next, make your way to the Musee du Petit Palais, an art gallery that’s packed to the brim with paintings from masters such as Botticelli and Vittore Carpaccio. Before you start making your way north, take a short detour to the east to L’isle sur Sorgue. It’s only a small place, but L’Isle sur Sorgue is the kind of destination that you won’t soon forget. This small village is noteworthy for its canals, which are the reason why the town has become known as the Venice of the Comtat. The overall effect is one that will leave you feeling like you’ve landed in a postcard, with mossy green water wheels lining the canals and charming houses and shops on all sides. It’s also something of a capital for antiques trading, with several hundred market stalls popping up every weekend, and even more during dedicated antiques events. You’ll only need a lazy afternoon to stroll along the canals and explore the town, although you can stay the night (Camping La Durance offers a handy campground just down the road) if you’d like to check out some of the local churches and art galleries as well. Continue east to Roussillon (just be sure to type in Roussillon, Vaucluse to differentiate from another Roussillon to the north). 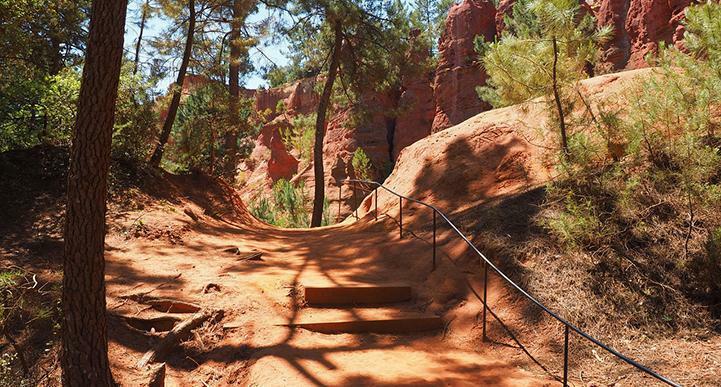 Roussillon is a charming village known for its ochre deposits, which has led to much of the city being built and decorated with this bright hue - and consequently helping the village win the title as one of France’s most gorgeous destinations. Iron oxide deposits in the area are the reason behind the town’s bizarre colouring, and mining has been banned since 1930 in order to protect this amazing sight. You need only to stroll through the streets to get a feel for this vibrant (literally) township, although you can also take the Ochre Trails, two marked paths that take you through an abandoned ochre quarry. The hikes are not difficult (just 30 minutes for one and 60 minutes for the other), but the scenery is breathtaking, so don’t forget to bring your camera along for a few shots of this bizarre orange landscape. In the village itself, you can stop by and pick up a few ochre souvenirs from your time in town. From here, make your way back west then north via the A7 to drive from a town that is orange, to make your way to one named Orange. Orange adds another point of interest both for its Provencal vibes and mesmerising Roman history. The gem of the city is the Roman Amphitheatre, an imposing structure that is one of the best preserved in all of Europe. In fact, it’s the only one of its kind to have conserved its stage wall. These days, it is used throughout the summer season for the city’s annual opera festival, as well as for other events and performances throughout the year, so be sure to check the calendar before you arrive to enjoy a show here in the same place people have gathered for thousands of years. While you’re there, be sure to stop by the museum on site to learn more about the fascinating history of the amphitheatre, and grab a bite to eat at the restaurant. The old parts of Orange are also worth a look, as you can peruse the streets to enjoy its charming facades, cafes, shops, and restaurants. After Orange, make your way back to the A7 and continue your drive north to Valence, then turn off northeast onto the N532. It’s a bit of an odd attraction, but those are often some of the best during any road trip. It will make you look at history through an entirely new lens - through that of the humble shoe. The International Shoe Museum is a wonder, taking the seemingly mundane and turning it into a history and culture lesson that never gets boring. It’s found, fittingly, in the town of Romans, which is known for its shoemaking and leatherworking. The museum contains every shoe you could imagine, including the footwear worn by musketeers, to Chinese women’s ankle shoes, and everything in between. In total, there are more than 16,500 examples of shoes through the ages on offer here, covering more than 4,000 years of human history and telling the story of cultures throughout that time with simplicity and fascinating stories. After your exploration in shoes, be thankful you needn’t wear hiking boots to reach your next destination as you head back to the A7 and continue north to the town of Vienne. The last stop on this leg of your journey through the south of France takes you to the town of Vienne, a place of just 30,000 people but an impressive collection of sights as well as the historic atmosphere you have likely come to expect from the region. The town’s Roman Theatre is the hub of the city: this is where you’ll find regular performances throughout the summer season. The Temple d’Auguste et de Livie strikes a powerful outline in the centre of the old town, where it was built in roughly 10BC in honour of Emperor Augustus and his wife Livia. Nearby stands the medieval Vienne Cathedral, a place dedicated to St Maurice and a beautiful reminder of French-Gothic architecture of the 16th century. And to learn all about how the Romans lived, make your way to the Museum and archaeological site of Saint-Romain-en-Gal-Vienne, a modern museum set upon ancient grounds devoted to the histories of Vienne and the Romans. From here, it’s just a 30-minute drive north on the A7 to reach the end of this leg in Lyon. You’ll begin this leg of your tour in Lyon, an ancient city that brings together countless eras of history into one bustling and enticing destination. Should you find the will to continue on with your road trip, the rest of this leg will take you into smaller towns, off into the wilderness, up mountains, and through gorges. You’ll finish the leg in Grenoble and will feel rested, excited and invigorated at the same time from the huge array of activities along the way. The entire leg will take roughly a week to complete if you take it nice and slow (which you’ll want to do). 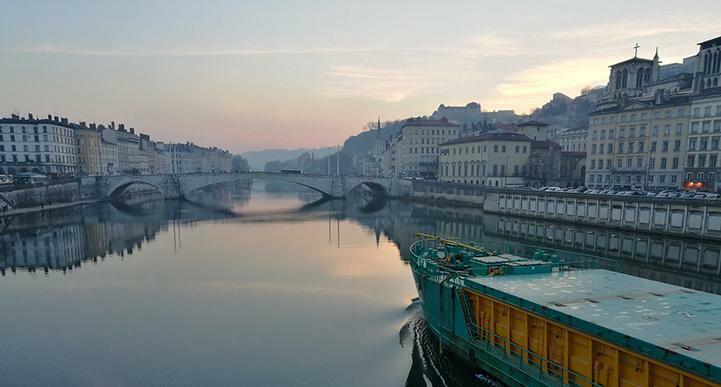 Lyon is a vibrant city found where the Saone and Rhone Rivers meet. It’s a place where thousands of years of history converge, with Roman, medieval and renaissance architecture and culture are evident at every turn. You can easily while away several days in this city, so be sure to plan ahead if you don’t have time to spare. Begin your tour with a visit to the Basilica of Notre Dame de Fourviere, a spectacular 19th century structure built upon a high point overlooking the city. The basilica is dedicated to the Virgin Mary and the site was once a Roman forum, and today you can take your own tour or join a free guided walk around the building. Another top spot is Vieux Lyon, ‘Old Lyon’, a 424-hectare area that offers one of Europe’s largest Renaissance neighbourhoods, and one that is a protected cultural site. Vieux Lyon is comprised of three distinct neighbourhoods and is a UNESCO World Heritage site, so allow a long afternoon and evening to discover its secrets on foot. When you’re ready for some lush greenery, make your way to the Parc de la Tete d’Or, a large urban parklands that’s ideal for walking, picnicking, and taking boat rides in the summer. When you’re ready to peel yourself away from Lyon, take the A43 southeast of the city for a 90-minute drive to your next destination. Aix-les-Bains has long been a small getaway destination for the wealthy, but is now a widely loved town by all. It’s found on the banks of Lake Bourget, where it is renowned for its natural thermal springs. If those hot springs sound like a much needed rest for your traveller’s feet, make your way to one of several spas in town such as Valvital, La Parenthese, or Thermes de Marlioz. As soon as you’re well rested and ready to explore, make your way to the Hautecombe Abbey, a beautiful lakeside building that serves as the final resting place for a number of kings and queens, princes and princesses. Take a drive up Mont du Chat (Cat Mountain) for some incredible views over the town, but keep in mind that if you plan to hike to the top, you’ll need to be quite fit and prepared to scramble to the top over boulders and rocks as it is not a quick and easy trek. For something a little more relaxing, pay a visit to the Faure Museum, an art museum that’s filled with works from Rodin and other artists of great renown. From Aix-les-Bains, follow the A41 northeast to the Gorges du Fier. The Gorges du Fier is an incredible natural attraction that will get you out of the campervan, away from the cities, and into the wilderness of the Haute-Savoie region. This attraction is a canyon river, but the best part is the footbridge that leads you through the canyon, giving you an up-close view that you’d never experience otherwise. The walkway is set 25 metres above the water, but there are markers so you can see just how far the water rises in times of flood. You can also check out numerous Giants’ Kettles (areas where the water has created cavities in the rock wall), and take endless photos of the light streaming into the canyon from above. Because of the narrow walls of the canyon, it’s best to visit around midday when the sun falls into the crevasse and lights up the entire walkway. It’s an easy walk and will only take an hour or so to visit, and costs roughly €6 each for adults. Next, it’s time for a detour. Continue heading north then turn off eastwards onto the A40 to reach Chamonix. Throughout any season, Chamonix is a place of adventure and magic. 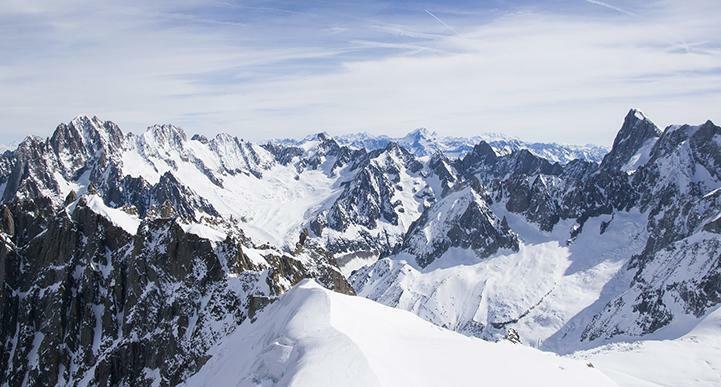 Once the setting of the Winter Olympics, Mt Blanc is a year round playground with world-class skiing and riding in winter, and epic gondola-access hiking trails through summer. The Chamonix Valley is filled with restaurants, bars, and shops (and campgrounds for RV travellers), and you can take a ride up the cable car to check out the jaw-dropping views from the mountain top whether or not you plan to go hiking or skiing once you’re up there. There is an endless list of things to do in Chamonix, from sledding, ice skating and ice wall climbing in winter, to swimming, paragliding, tennis, and mountain biking in summer. Plan to spend a few days in this area, but whether you take that time to relax and chill in the spas or go all out with adrenalin on the mountain is up to you. From here, head back down the road you came in on and past the Gorges du Fier, this time cutting into a regional natural park. You’ll drive through the stunning Regional Natural Park of the Bauges on your way south to your stop in Grenoble, but don’t pass through without a few breaks to explore this wilderness. 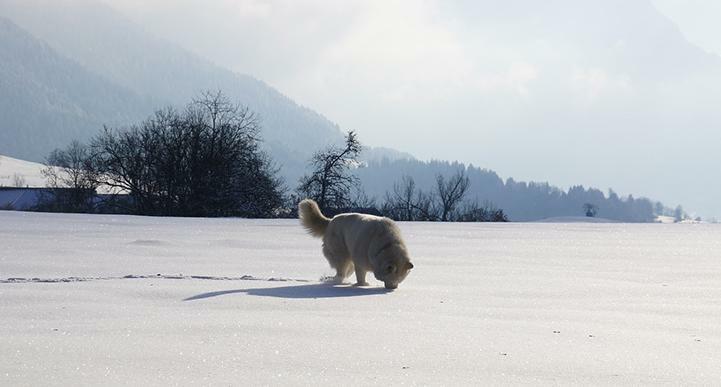 In winter, it’s home to Nordic (cross-country) skiing, offering a fun and easy way to check out the scenery on foot. Come summer, it’s perfect for hiking and mountain biking, and you may even spot some of the local wildlife such as ibex, foxes, and marmots. When you’ve had your fill of natural scenery, continue along the A41 heading south to begin the fourth leg of your trip in Grenoble. As you continue your campervan road trip through the south of France, this leg will introduce you to a series of stops where you can explore each place in just a few hours - or stay a few days. 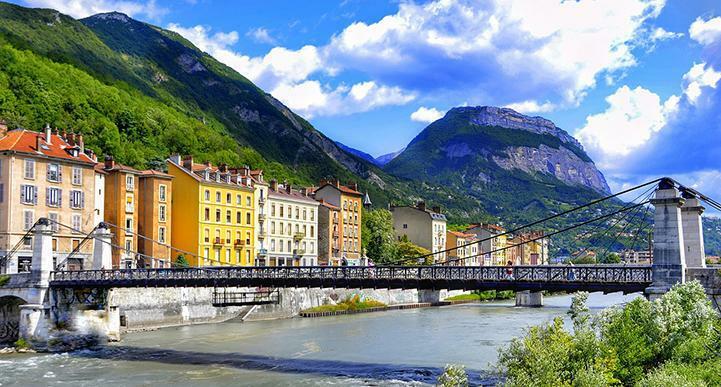 You’ll get started in the city of Grenoble with its nature and history, then move on to an underground cave system, a stunning gorge that’s ideal for swimming and hiking, a towering citadel, and a relaxing garden area. You can move through this leg fairly quickly should you need the time, or you can stick around and relax to make the most of that motorhome holiday vibe. Grenoble is a picturesque town known as the Capital of the Alps, and offers just as much in the way of scenery as it does for history. Begin your visit with a ride up the cable car ‘bubbles’ (the first urban cable car in the world) for a view out over the city and a chance to explore La Bastille, the hilltop fortress complete with a watchtower and dungeon. At the base of this hill, you’ll find the Archeological Museum of Grenoble, which is home to artifacts from across the centuries, including tombs excavated hundreds of years ago and relics from the Middle Ages. Plus, admission to the museum is free! And for that classic European feel, follow your feet into the Vieille Ville, the Old Town of Grenoble, where cobblestone streets line the way from one attraction to another. Check out the Grenoble Cathedral, the Place aux Herbes (look for the bi-weekly farmers’ markets if you’re there on a Tuesday or Sunday), and the Place des Gordes while you’re there. Before you start your drive south towards your eventual final destination of Nice, take a small detour via the A49 into an underground oasis. 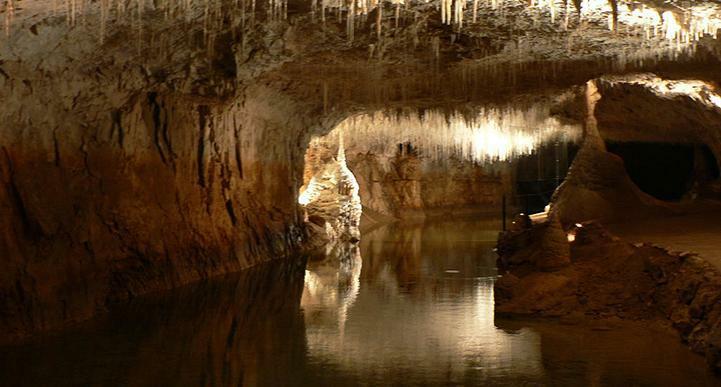 La Grotte de Choranche is a mesmerising underground cave system filled with incredible rivers, lakes, and stalactites. Take a guided tour through the grotto and experience the magic of this ancient place, which has been lit up with enchanting lights so you can make the most of your visit. Note that guided tours are currently only available in French, but you can pick up English brochures in the visitor’s centre so you can read about the cave as you walk through. The visit will take just an hour, and be sure to wear warm clothing and sturdy footwear as it’s cool throughout the system. After the cave, make your way back past Grenoble and south on the A51. Gorges de la Meouge provides the perfect opportunity for a pit stop to get out, take a dip in the fresh waters of the Meouge River, and even spend a night or two in the campground at Camping Gorges de la Meouge. The gorge itself runs for just over 7 kilometres of the Meouge River, and its limestone walls make for beautiful and interesting scenery along the way. It’s ideal for hiking, and if you’re there on a hot day, jump out of your campervan and take a dip in one of the gorgeous basins carved out of the limestone by the water. From here, it’s a short drive back along the main road down to the Sisteron Citadel. 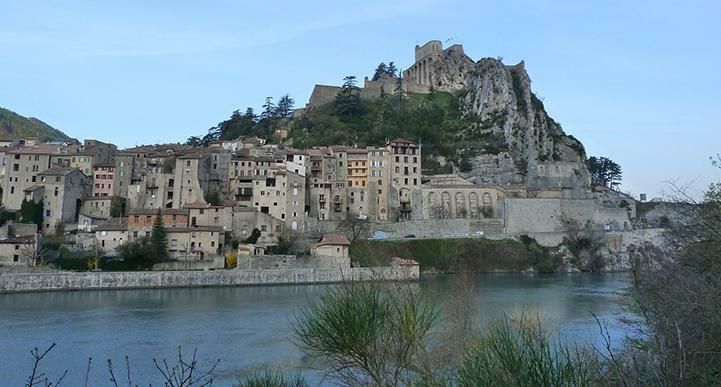 The Sisteron Citadel is easily spotted as soon as you approach the town of Sisteron. This fortress is built high upon an outcropping of sheer cliff and rock overlooking the village, and covers 10 hectares of land on the border of Provence and Dauphine. While the structure was damaged during bombing in World War Two, it has been beautifully restored so you can take a tour of this historic building today. You’ll see the dungeon, chapel, and powder store, and you can pay a visit to the museum to learn more about the citadel’s rich history. 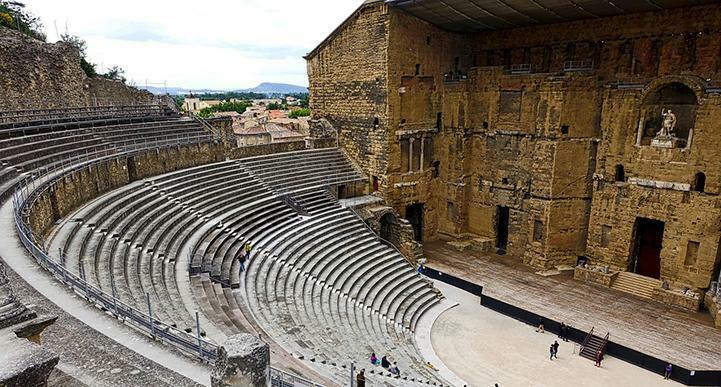 If you arrive in July or August, check to see if there are any live performances scheduled, as the open air theatre at the citadel is used throughout this period as a stage for one of the oldest music festivals in France. Afterwards, continue south on the A51, but don’t miss the chance to take one final detour on this leg before continuing south. Not far from the main road south lies Jardins de Salagon, a gorgeous garden and public museum that, with the remains of the Salagon Priory, is classed as one of the notable gardens of France. Here you can explore the medieval priory and stroll through the gardens to see some of its 1,700 plants. There are both permanent and temporary exhibitions at the museum throughout the year, although keep in mind that the site usually closes in mid-winter through January each year, so double check before visiting if you’re there around that time. You’ll only need a couple of hours to explore the gardens, then you can hit the road again and drive southeast to the Verdon Gorge to begin the final leg of your France motorhome tour. Much like earlier legs of this itinerary, this section covers just over 250 kilometres - not even six hours of driving time in total - but includes multiple unforgettable stops along the way. You’ll begin this drive with a stop in Europe’s answer to the Grand Canyon (the Verdon Gorge), then move on to one of the prettiest little villages in the country. From here, you’ll stop off at the final few destinations of this itinerary, each of which are world-renowned French Riviera towns along the sun-soaked southern coast of France. Take your time and enjoy this final stretch and spend roughly a week covering these last iconic destinations. 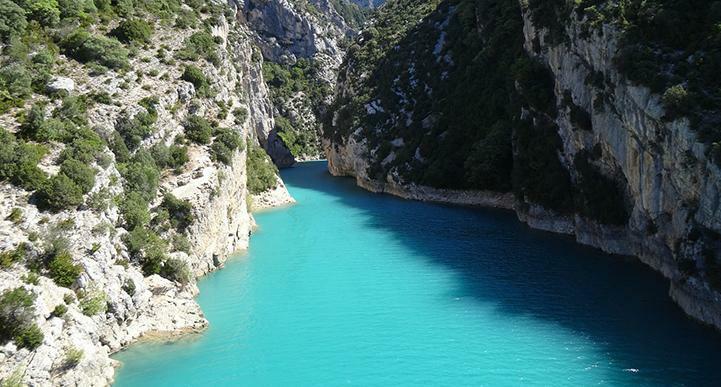 The Verdon Gorge is another river canyon, and this one is believed to be one of the most beautiful in all of Europe, even earning itself the moniker of ‘The Grand Canyon of Europe’. It’s known for its bright green-blue hue, and while you can’t drive alongside it, you can get out and explore by foot - or even by boat. One of the most popular activities here is to hire kayaks for a day of cruising up and down this peaceful waterway, although you can also hike or even rock climb to take in more of the views. It’s also a spot that’s rich in birdlife, so you may be able to see eagles and vultures, amongst other powerful birds of prey. Bring your camera, binoculars, and sunscreen, and explore one of France’s most stunning natural destinations. From here, it’s a slow and winding (but very pretty) drive south to your next stop. Seillans isn’t about its attractions, Seillans is the attraction. This small village of just a couple of thousand people has been voted as one of the most beautiful villages in the country, and when the country in question is France, you know you’re in for a treat. There are cobblestone streets, fountains, a ruined chateau, flowers, bistros, cafes, and a generous serving of that laid-back small town feeling. Park your motorhome and spend a day finding out for yourself why this charming spot is so well loved by visitors from around the world. Next, make your way south - all the way south. The D25 will take you down to one of the country’s most well-known beachside destinations. St Tropez is a little out of your way, but you could hardly call it a road trip through the south of France without including this famous destination and its beaches, art scene, and nightlife. The city’s name is synonymous with 50’s and 60’s Hollywood glam, and that reputation has continued with a bevy of bars, clubs and restaurants right next to the waterfront that still attract plenty of famous faces to this day. Much of your time here can easily be spent relaxing on the beach and checking out the famous establishments along the waterfront, but there are also a few key attractions you might like to visit. The Annonciade Museum is a good first stop, as this art gallery includes key works by French painters such as Matisse and Derain, who lived in and worked in St Tropez during their careers. The Citadel of St Tropez was initially built to help defend France against the Spanish, but today this towering structure simply offers plenty of history and incredible views over the city. After St Tropez, you can either follow the coastal route up to Cannes (roughly two hours), or head inland for the slightly faster (roughly 90 minutes) route via the A8. Cannes is a shining gem in the crown of the French Riviera. The town is known for its immense luxury, with superyachts and boutique hotels at every turn, and streets filled with brands like Porsche, Ferrari, and Maserati. It’s known for the annual star-studded Cannes Film Festival and offers plenty of history to boot. 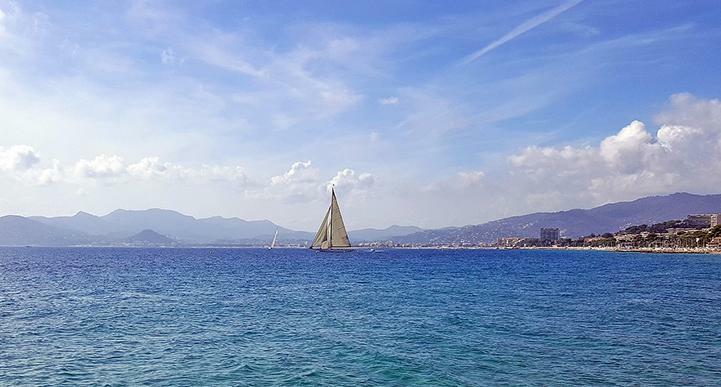 The first thing to do while you’re in town is to take a stroll down La Croisette, the mile-long promenade that runs alongside the waterfront, making for some exceptional people-watching and sightseeing along the way. You can also take a quick 15-minute ferry ride across to the Iles des Lerins, where you can spend a full day exploring these two tiny and traffic-free islands to see the Fort de L’ile (where the real life Man in the Iron Mask was imprisoned) and the Abbaye de St-Honorat. And for a little bit of normality in such a luxe town, stop by the Marche Forville, a daily market where you can pick up everything you need for a picnic on the beach. Again, you’ll have the option of following the slower coastal road up to your final destination of Nice, or taking the slightly inland A8 for a quicker drive. Either way, it’s less than an hour on the road to this last southern France city. Beautiful old architecture, oodles of sunshine, markets, bakeries, cafes, beaches, and waterfront restaurants - Nice truly is a world-class destination. Before you hand over the keys for your motorhome, take the opportunity to spend a few days with it exploring what the city has to offer. Naturally, your first stop will be the beachfront and the Promenade des Anglais for a stroll along the stretch of golden sands that makes the city so alluring. Next, pay a visit to both the Musee Matisse and Musee Renoir, both of which offer insights into the lives and works of these famous French artists who made the city their home. For something a little different, visit the Russian Orthodox Cathedral, a French national monument and inspiring piece of architecture that stands out from its classically French surroundings. 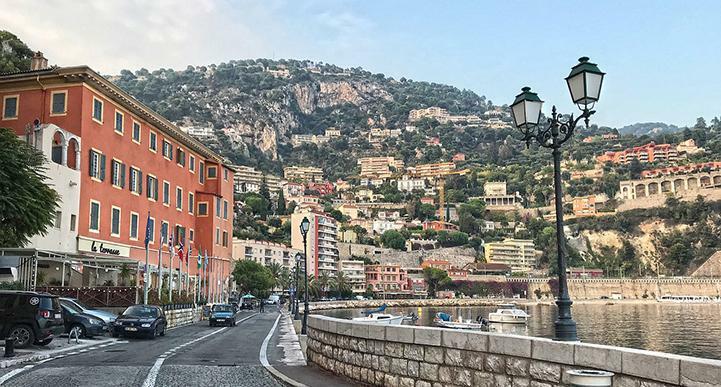 Then, once you’re ready to say goodbye to your motorhome, take to the streets by foot to explore the old town of Nice, a gorgeous cobblestone area filled with small alleyways and hidden gems around every corner. In many ways, the south of France is the perfect place for a campervan road trip. You need only travel 30 minutes down the road to find the next incredible attraction - be it historic, natural, or modern. This RV itinerary will unlock the secrets of Provence, the French Riviera, and plenty of places in between as you make your way from Marseille, up through small townships and larger cities such as Lyon, then back down to the coast to iconic destinations such as Cannes and Nice. There is no ‘bad’ time of year to take this drive, and there’s every reason to start planning your trip today.